Trust us, neither the cards nor the stars foretold these crazy events. 10. Atty. Ferdinand Topacio proposes a new Department of Tourism (DOT) slogan. Former First Gentleman Mike Arroyo’s Adolf Hitler-loving lawyer feels for the DOT, who is now fielding "copycat potshots" for its "It’s more fun in the Philippines" slogan. 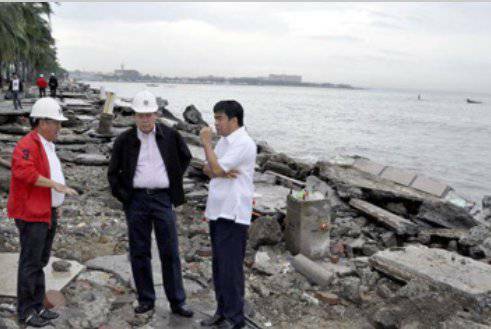 Topacio, who had declared, " I’m willing to do the worst. Ipatatanggal ko ang itlog ko ’pag di bumalik ang mga Arroyo (I’ll have one of my balls removed if the Arroyos don’t return [to the country])," comes up with an edgy tagline that will make the Philippines stand out. He calls a press conference and unveils a large poster that reads: "Tanggalin n’yo ang itlog ko if it’s not more fun in the Philippines." 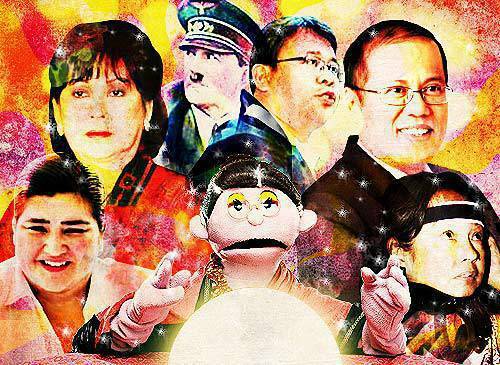 Topacio also offers to "revamp" the colorful banig logo by suggesting that Hitler’s favorite symbol be superimposed over the graphic representation of the archipelago. 9. The Metropolitan Manila Development Authority (MMDA) proposes a new way to instill discipline in pedestrians and motorists, while solving informal settlers’ housing woes. The MMDA will declare that any motorist who hits a jaywalker will be paid P150,000 in cash, no questions asked. Within 24 hours of implementing the said law, there will be no more jaywalkers in Metro Manila. On the other hand, drivers who are caught violating traffic laws and proven guilty beyond reasonable doubt will have their vehicles impounded and licenses revoked forever. The seized vehicles will be given to the poor in lieu of the Conditional Cash Transfer allotment. This way, informal settlers can live in "mobile homes" instead of rat-infested, fire-prone shacks. However, since the MMDA is merciful, remorseful vehicle owners are given the chance to redeem their vehicles and licenses if they successfully complete The Jaywalking Challenge on Commonwealth Avenue. They have to cross the "killer highway" while there are at least 100 vehicles are speeding through it. If they live through the test, they can have their vehicles and licenses back. The problem is, they will most likely fail in this endeavor as motorists will surely be hell-bent on getting the reward for hitting jaywalkers. How many more Enteng Kabisote movies will be made? 6. The Department of Public Works and Highways (DPWH) launches a beauty contest. In a bid to turn last year’s lemons into lemonade, DPWH launches Miss Photoshop Philippines. The participants of the tilt are pairs made up of women and their Photoshop buddies. The women submit their Photoshop-altered photos and then, if the handiwork is deemed topnotch, they’re in the running for the title. The woman with the best Photoshop-edited image wins and her Photoshop buddy gets hired by the DPWH. 5. The Aquino government fires up its anti-corruption drive and puts a stop to the botcha phenomenon at the same time. Impatient and incensed by the gall of some of the nation’s politicians and government workers, P-Noy quits playing Mr. Nice Guy and decrees that any politician or government employee caught stealing from the nation’s coffers will be imprisoned and made to eat botcha. The politicians will be rounded up and locked inside rooms with cameras. They will be filmed 24/7 and fed only botcha for the rest of their lives...which may not be too long. Their confinement will be broadcast live. People will refer to the "show" as Pinoy Big Botcha. <>4. National Geographic pays for the right to shoot a new series at the Ninoy Aquino International Airport (NAIA). With the working title Airport Animals: Snakes, Bees, and Birds, the Philippine edition is the first installment of the series. Eventually, National Geographic will also cover other animal-friendly airports around the world. The fee from National Geographic will help augment the costs of NAIA’s rehabilitation. Perhaps, there’ll be enough cash to set up an animal sanctuary. NAIA will then be known as the only airport in the world with an animal haven. Unfortunately, after only six months, the zoo staff will soon go on strike and set free all the animals in the sanctuary. The resulting chaos is good for the National Geographic team, but pretty bad for the people who have to contend with attention-seeking snakes on planes, frantic bees in restrooms, and incontinent birds flying over the tarmac. We consulted a "cosmic energy alchemist" who refused to be named. She advised: "Airport authorities can prevent this cursed event from happening by suspending the collection of terminal fees." Adopted ka lang ba na Pinoy? Wala ka yatang dugong Filipino dahil hindi mo mahal ang ating national pastime." Nevertheless, the congressman fights for his proposed law. Later on members of the Catholic Bishops Conference of the Philippines (CBCP) suggest that videoke singing should only be allowed in residential areas as long as people are belting out religious tunes and not songs that will destroy the moral fiber of society. When the congressman refuses the CBCP’s request, religious groups storm his office and conduct an exorcism. The Anti-Videoke Law, as expected, gets stalled. The Wizard of Oz). Charice Pempengco is tapped to play the young GMA, while Nora Aunor plays her as an adult. To draw more crowds, Dan Hill is hired to play Mike Arroyo and Anne Curtis will play Luli. To make the musical interactive, random men from the audience will be asked to sing the parts of Mikey and Dato. 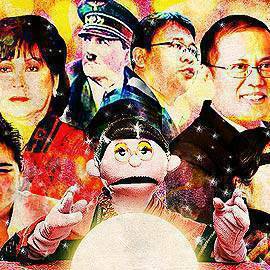 <>Image credits: All images are screenshots from ABS-CBN, ANC, GMA-7, and YouTube video clips, except for Manang Bola (Batibot publicity still).